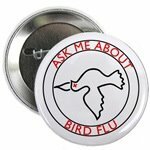 Zap*Germs: Trendy H5N1 Apparel - Be A Bird-Flu "Booster!" Trendy H5N1 Apparel - Be A Bird-Flu "Booster!" Don't be left behind in the bird-flu panic! Show your fear (pretend it's just ironic postmodern ennui) -- or just clue others in to H5N1 -- with cool shirts, hats and buttons from H5N1 Wear! Are Photo-Journalists Spreading Bird Flu?? New Bird-Flu Vaccine Protects Which Half?